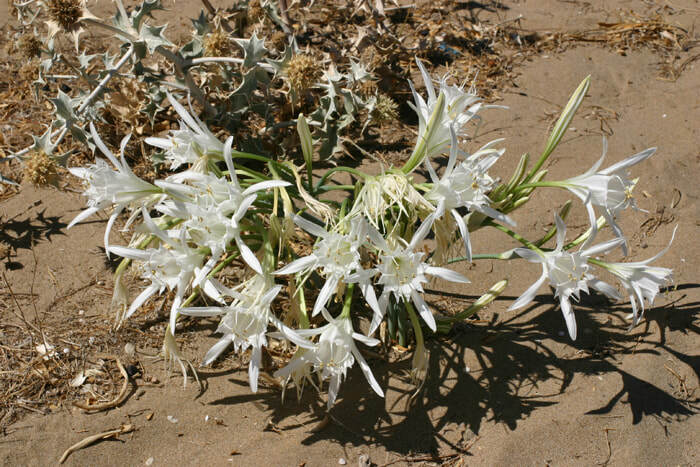 The year 2007 was the first time that I visited Chania in September and I was hoping to find Pancratium maritimum. I did not find it in the tourist beach in front of our house in Kalamaki but after quite a walk I found a few flowering plants in the Agioi Apostoloi beach. 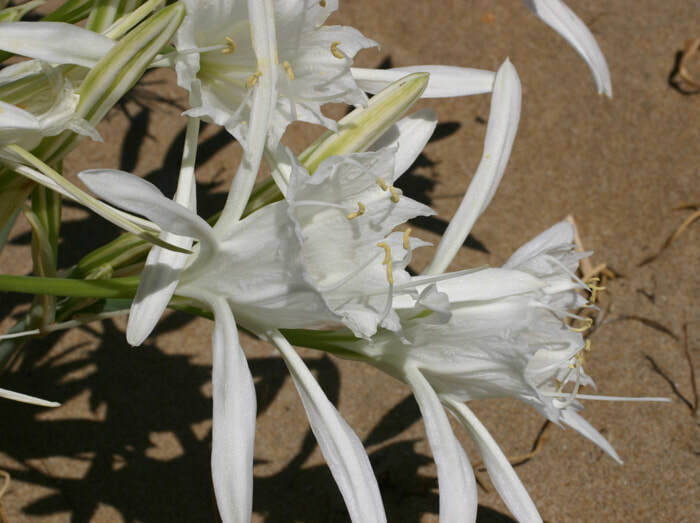 A little further I came at the Chrysi Akti beach and there were many hundreds of flowering Pancratium plants. Really a beautiful sight! And what really surprised me was the fact that Chrysi Akti is a very tourist beach visited by hundreds of (mainly Scandinavian) tourists every day in September and the tourists did not damage any flower, they just left them in peace. The Sea Daffodil is one of the most beautiful of the wild Cretan flowers and can be found on most of the northern beaches of Chania. Other vernacular names of the Sea Daffodil are Sand Daffodil, Sea Lily and Sand Lily and this indicates where it lives: the habitat of P.maritimum is the maritime sands on the sandy beaches in the immediate vicinity of the sea and it often produces dense stands. This habitat is characterized by direct exposure to the sun and the sea winds and to continuous sprays of salt water droplets carried by the wind. This monocotyledonous herbaceous perennial flowers during the hottest months of summer. It can withstand these extreme conditions because its large bulb (about 5 - 7cm across) is buried deep underground and because it grows in sand, it is not that difficult for its shoots to make their way up through half a meter of loose coastal sands. 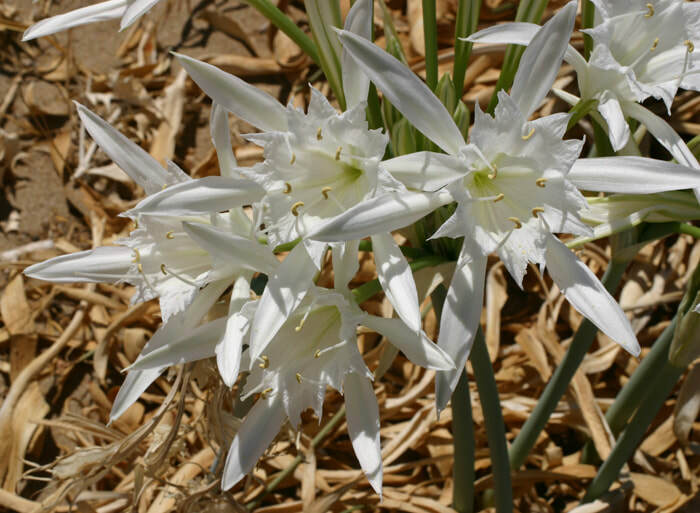 The Sea Daffodil flowers from July until October with large, funnel-shaped flowers, 3 – 15 in every umbel, fragrant and white. The flowers are pure white, very large up to 15 cm long (from which the pedicel is less than 1 cm) and 6 – 8 cm across, with a funnel-shaped crown, white striped with a little green line on the outside of the 6 tepals, which are near the base fused with the filaments of the stamens, on a stout stem up to 45 cm high, above 2 spathes or thin, paper-like bracts. The flowers have a sweet exotic lily scent. This fragrance is so strong that it is said that the strong perfume of the flowers keep sheep away from the coasts. The long narrow perianth segments are almost linear and 40 – 50 mm long. The very long, funnel-shaped 12-toothed corona actually consists of the fused filaments of the stamens and can measure up to 65 mm long and 40 - 50 mm wide, with the stamens at its margin, see ill. 3 and 4. (Note about the perianth segments: because the 3 sepals and the 3 petals are identical they are referred to as 6 tepals). The margin of the corolla tube is “decorated” by 12 triangular teeth, this way making the corona of the flower look like a ....crown (corona means .... crown !!!). There are two of these teeth between every of the 6 anthers (i.e. 12 teeth). The buds look like little raised fingers, enhanced with white and green stripes. The 6 tepals frame the corona in the way that it looks like a daffodil, giving the plant its common name Sea Daffodil. The leaves appear at the end of autumn and look like long, about 2 cm wide and half a meter long, linear ribbons and by the time of flowering they have already withered and frequently the dead leaves have disappeared by sun and winds before the flowers emerge from the sand. These leaves are often twisted in a spiral. The fruit is a large (up to 6 cm long) 3-valved capsule that at maturity opens at the sides of the 3 carpels, exposing the 10 to 40 very black seeds, see ill.6, 8 and 10. These seeds have an irregular shape (ill.11) and look like pieces of charcoal and they simply drop out of the opened capsule into the sand. They are probably dispersed by the wind and sea as they easily fload on the water. 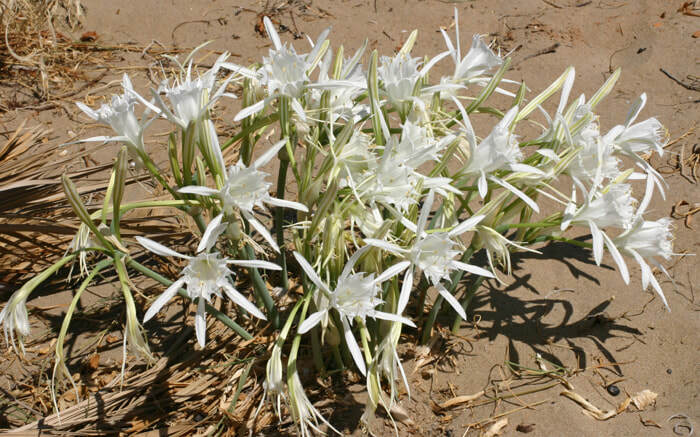 The spreading of the Pancratium Lily in Greece during the modem age, and particularly in the islands of the Aegean Sea, has been subject for study for botanists and archaeologists. 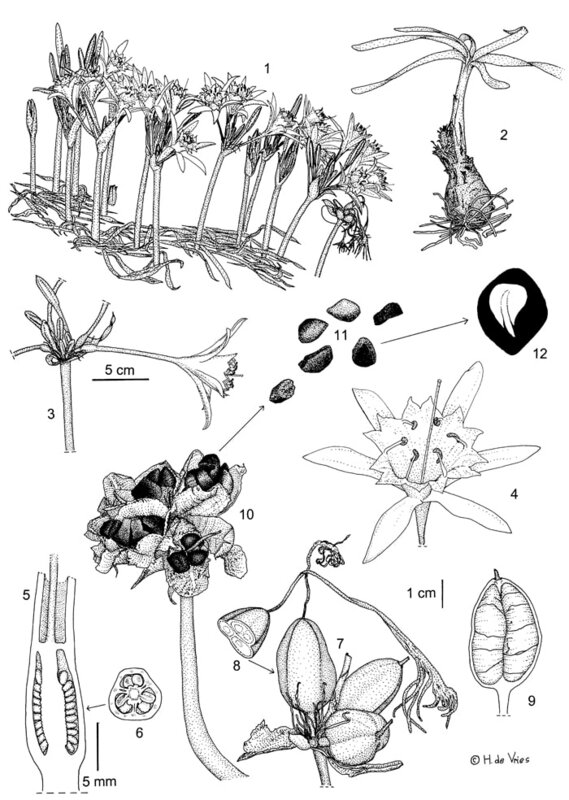 Hegi (1931), describing the foreign plants of the Amaryllidaceae family mentions that this plant belongs to the most interesting plants in the Mediterranean. 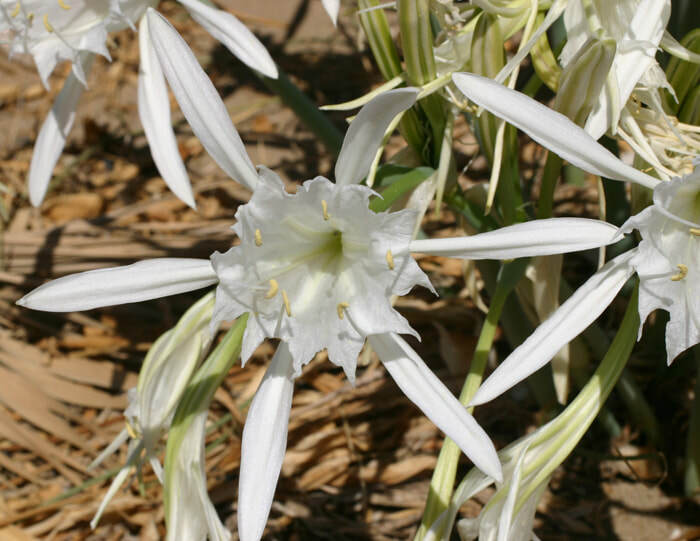 The first representation of the Pancratium Lily is mentioned by Evans, who discovered it during the excavations he made in the palace of Knossos (1896). There is a painting of this plant in the well-known wall painting with the blue-bird in the palace of Knossos which is considered as the first representation of the Sea Daffodil. Its use is described by Dioscorides and Theophrastus. Some notes on the pollination of Pancratium maritimum and possible pollinators. Fabrizio Grassi cs (Biodiversity and Conservation 14: 2159 – 2169, 2005) wrote an article called: “Evaluation of biodiversity and conservation strategies in Pancratium maritimum L. for the Northern Tyrrhenian Sea”. According to these scientists, pollination is reported to be due to different organisms: the very large Sphinx (= Agrius) convolvuli L.(the convolvulus hawk-moth) in Southern France, sphingid moths in Isreal, or the lizard Podarcis lilfordi on the Balearic Islands. They found that the pollinators were large hawkmoths by marking the flowers of certain Pancratium plants with a fluorescent dusting powder and capturing insects frequenting the site and noting to what extent this powder was transferred by the pollen vector. They labeled the flowers that they watched for subsequent determination of fruit set. Eisikowitch and Gagil also measured the wind speed. They found that when the wind speed remained under 2 m/sec, moths regularly visited the flowers and these flowers produced fruit and seed. However, when the wind speed was above 3 m/sec, the moths did not fly and that the flowers which opened on such nights remained unpollinated, and did not set seed. Plants that flowered in late summer when the moths had left, even when the nights were calm, no seeds were produced. Artificial crosspollination affirmed that the flowers were still fertile. These observations show that the hawkmoths are indispensable pollinators of the Sea Daffodils and that efficient pollination is achieved only under favourable conditions (little or no wind). Many plants depend on insects for pollination, but I find it fascinating that the Sea-lily depends on a migratory large moth that is only available in a limited period. It is very interesting that the flowering period of Pancratium maritimum (July-September) AND the time the flowers open (from the end of the afternoon until the next afternoon) coincides with the presence of the nightflying hawkmoths. Pancratium: comes from the Greek and literally means “All Strength” (compare with “Pandocrator or Pandokrator”, the Almighty), perhaps referring to the supposed tonic properties of the plant (as described by Dioscorides and Theophrastus), or to the strength a plant must have to tolerate the extreme climate of the hot and dry summer beach.